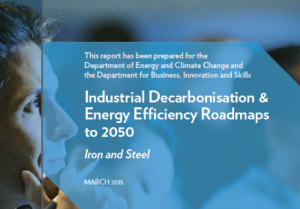 On 25 March 2015 the UK Department of Energy and Climate Change (DECC), together with the Department for Business, Innovation and Skills (BIS), released a collection of in-depth studies on the potential pathways for cutting CO2 emissions from heavy industry entitled “Industrial Decarbonisation and Energy Efficiency Roadmaps to 2050”. 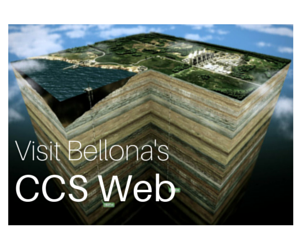 Bellona strongly commends the undertaking of this study and welcomes its key conclusion, namely that Carbon Capture and Storage (CCS) technology is the only viable route to tackling CO2 emissions from steel, cement, chemicals and refining. In an earlier article we looked specifically at the case of cement. This article takes a closer look at the decarbonisation options for the iron and steel industry, which represents some of the UK’s biggest emitters of CO2. The significant contribution of the iron and steel sectors towards CO2 emissions is due to the energy intensity of steel production, its reliance on carbon-based raw materials and fuels, and the large volumes of steel produced. Total UK steel sector emissions amounted to 16.6 million tonnes of CO­2 in 2011, and inflating to 22.8 million tonnes in 2013. The sector accounts for 9% of industry’s energy use, the majority of which is used for high-temperature processes. Despite industry’s long-term commitment to reduce its CO­2 emissions, the UK iron and steel sector continued to consume large amounts of energy, over 70% of which is used to provide heat, often at very high temperatures (over 1,000°C). 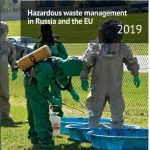 The steady increase of emissions in recent years also reflects the limits to technological opportunities that can further improve energy efficiency, with only relatively small incremental improvements in energy consumption. The Business-As-Usual (BAU) pathway represents continuation of existing trends in energy efficiency and decarbonisation. Incremental options provide savings earlier in the pathway, and major options including stove flue gas recycling and steam or power plant upgrades implemented by 2050. The 20-40% CO2 reduction pathway is similar to BAU but with increased deployment of stove flue or top gas recycling in most integrated Blast Furnaces– Basic Oxygen Furnaces (BF-BOF) sites from 2030 to 2050. In addition, the plant rebuild option using advanced steel production technology is applied late in the pathway, giving further emissions savings. 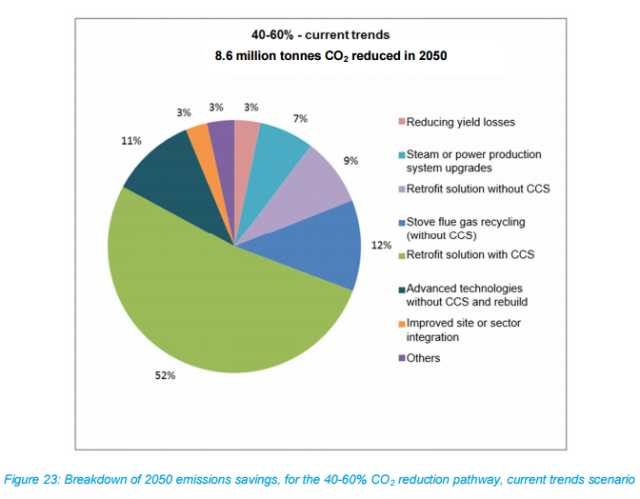 The 40-60% CO2 reduction pathway adds to these measures through deployment and retrofitting of carbon capture and storage (CCS) technology from 2035, to 75% of BF-BOF sites by 2050. Max Tech pathway consists of the maximum deployment of the CCS technologies, in which half of existing BF-BOF sites have been rebuilt using advanced technologies and integrated CCS, and the other half of existing sites have been retrofitted. The study also notes that the ‘Max Tech’ emission reduction pathway is based on the assumption of availability of CCS technologies. In the absence of CCS, only emission reductions of 41% can be achieved, as opposed to 60% or more with CCS. What is more, the combination of CCS with sustainable biomass would achieve a 63% emissions reduction. 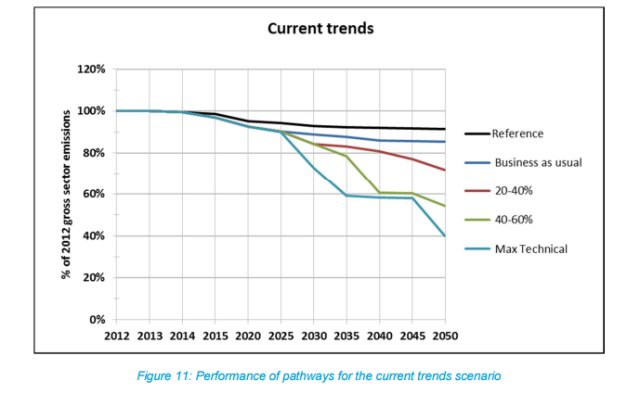 The graph below illustrates a breakdown of the 2050 emissions savings for the 40-60% CO­2 reduction pathway. In this scenario, the key role of CCS is made clear, as 52% of emissions reduced in 2050 would stem from the application of CCS. The DECC studies make the case for CCS in energy intensive industries increasingly clear. In a society and economy with an urgent need to reduce emissions, the pathway to retaining and growing the industrial and employment base is through CCS. 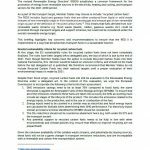 For more on the case of decarbonising the cement sector, read this article.